T - sour, fruity, tart. Belgian base comes through. Dry finish. Some faint cough syrup. Balsamic vinegar. M - good bit of alcohol burn on front of tongue but booze creeps up on you. Despite the foaming, not much carbonation. Coats mouth with that lingering tartness. O - this was my white whale after drinking one fresh a few years ago and not realizing that some aging could do it some good. Love the sour and tart character this takes on. Beyond 6 years could accentuate the vinegar qualities. Belgian base readily apparent. 5 years out is probably prime time. 2011 bottle - it's been way too long since i last had this (2010). a nice clean light amber pour with 2 fingers of head which diminished slowly and left behind a nice frothy lacing. smells of port wine barrels, raspberries, caramel. the flavor is VERY sweet, tons of raspberry, a huge alcohol warmth is a bit overwhelming but goes down smooth after the first few sips. lots of caramel, berry, wine barrel on the end of the palate. full body with low carbonation.. sticky on the lips, very booze heavy and warm. this is an outstanding beer and i'm sad it hasn't been produced regularly in 2 years now. 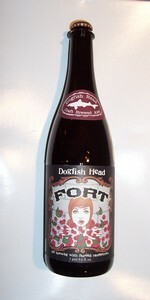 dfh needs to bring this one back for good, even if it's a small 12oz bottle like 120/wws. Surprisingly, for a Belgian style it didn't overflow with an uninformed hard pour. It leaves a decent amount of lacing on the Dogfish Head snifter. It has a reddish hugh. Mainly clear. Smells yeasty with sweet fruit. Raspberry up front, but a lot stronget in the aftertaste for me. A nice Belgian base. Slightly spicey, with some sour, musty yeast. Seems to be a decent amount of hops. I notice some bitterness in the middle. There is also some alcohol at the end, but not too bad. Excellent feel. Creamy, with a slight crisp bite. Poured from a 750 mL bottle into an enlarged snifter. This was bottled in 2011. Appearance: Pours a deep, raspberry red/maroon and gives an off-white head that fades almost immediately to nothing. Pretty opaque and raspberry colored. Smell: Big, sweet raspberry syrup, molasses, malts, bourbon, vanilla, hint of alcohol. Big smell, but not overwhelming. Pleasant. Taste: Sweet raspberry syrup, molasses, caramel, malts, a bit of spike, hint of tart raspberry. Like big candied raspberry malts. Big flavor. Alcohol is masked well - this is very drinkable, maybe the 3 years since bottling has something to do with that. Mouth-feel: Low to medium carbonation with a medium syrupy body. Finishes with just a bit of booze. Overall: Like sweet raspberry syrup this is quite sweet, but enjoyable. The alcohol is masked well, yet gives it some character. I drank the whole bottle and enjoyed it. Lots of flavor though, with a nice variety of influences. 12 oz bottle from 2015 aged in wine fridge and poured into Kane chalice. L: Tiny head that disappears almost right away. An 18% ABV will do that for you. No lacing, tiny ring. Beer is a mostly clear deep Amber. S: The smell is all macerated raspberries, honey, and sweet malts. Surprisingly, you really can't pick up the alcohol. T: But you can taste it. The good thing is after 2 years it has mellowed considerably, justifying my decision to skip a review then. Raspberries up front, with honey and sweet malts. Very much like a mead. Alcohol is there, but doesn't dominate finish, fortunately, and competes with sweetness. F: Full bodied, medium carbonation. Balance much improved by aging. Construction simple, but good. OK drying or sweetness would become cloying. ABV heat there, but not overbearing. O: A good once in every great while dessert beer. Definitely age this. Amber colored with reddish hues. Off-white head that sinks down into a thin whisp of foam on top of the beer. Straightforward aroma of raspberries and alcohol. The flavor is way more powerful than the aroma and hits you with intense raspberry cough syrup, bordering on medicinal. It's strong and challenging but just not very enjoyable, plain and simple. There's heat in the finish, but it's not cloyingly sweet. In fact, it finishes on the dry side. That being said, I was pretty much done with this after about 6 ounces. In hindsight, I should have split this bottle with someone but I decided to take on the entire bottle after getting a promotion at work today and the bottle won. Fort 1, Jacobob 0. More subtle aroma than expected, though there are definitely raspberry notes and booze. Flavor is sweet, but the alcohol heat counters, providing a dry finish. Raspberry is noted and pleasant, but doesn't lend any tartness. Almost medicinal, wIth an alcohol burn. An insane amount of raspberry and alcohol make this a very dry fruit beer with challenging warmth and strength. The pour delivers a hazy ruby/mauve color with low carbonation which struggles to form any head. Yet and dainty foamstance slowly builds to a sheet atop the glass. No lacing, light legging. Deep raspberry notes fill the nose and over take any base beer character. Alcohols provide a sharp sensation in the olfactories. Tart and bright aromatics, albeit somewhat one-dimensional. Flavors closely mimic the aromas with the big lead in from the raspberry puree. A mix of under rippened and over rippened berries provide sharpness and brightness as well as deeper and richer varieties. A spicy Belgian-like flavor gives a little extra spiciness and enough of a fruity backdrop to add much needed complexity to the taste. Again, alcohol flavor provides a lot of rose-like esters and spicy paint-thinner flavor. No hop character. A quick and fleeting sweet start soon develops into a thinning, dry, and spicy/hot feel because of the 18%. While the sweet start gives the richer raspberry flavors, the later 90% of the session gives the more tart and dry character. A true fruit beer that lives up the craft beer name. A nice transition of raspberries leads to a very alcoholic finish. Still, the beer finishes quite one-dimensional and over done. A: Reddish brown, cloudy, with a good tan head. S: Boozy and fruity like port with a caramel sweetness, dark fruits, and raisin, and overall sticky sweet. T: Very sweet red wine and port, raspberry caramel, very little moldy hops in the background, almost like framboise with a slight banana character. M: Sticky, very slightly frothy, but mostly spritzy carbonation. D: Not very. This one is pretty harsh. This pours a nice amber-red and brilliantly clear, it has a slight head and good carbonation. The aroma is simply sensational. I inhale a great big hit of bitter raspberries, My mouth is starting to water, really. The taste is clean and dry. No doubt you are drinking a fruit beer here as the raspberries are definitely present, but don't get the wrong impression... this is no sissy fruit beer. The berries are crisp and bitter and there is very little sweetness here at all, some beautiful tartness. There is alcohol present, but it's so well complimented that you really don't know how much until you go looking for a listing (18% whoa!). A nice light body, something I think suits this beer as opposed to a syrupy fruit beer. What a treat. I can't wait to lay some of this down for a while and see what it's like around next Thanksgiving. Growler fill from Party Town. I was a little leary of splitting a growler of this, but it's Super Bowl Sunday so what they hey. Pours a murky, reddish brown in color. No head on the pour, but given the ABV that is perfectly understandable. Smell is strong puree raspberries and has an alcohol pop flavor. Just a bit of warmth from the alcohol which is quite the accomplishment given the high ABV. Decent beer, but not something I could or will drink regularly. Reviewed from notes, a dead computer had forced me to put pen to paper, how nostalgic. Split with Gf, she purchased this on a whim as she has developed a taste for dfh aprihop and festina peche. Poured from a capped 750ml bottle into an oversized wine goblet. Bottled 7/10/07. Firm pour yields 2 finger off white head. Brief head retention and minimal lace. Color is very cloudy, murky orange with a little sediment as my half was poured last. Nose-As to be expected loads of fermented rasberry, alcohol, and a sticky syrupy sweet undertone. Taste- Remincient of a lambic only much, much bigger and sweeter with less carbonation. Very thick, viscous, and syrupy. Lightly tart Rasberry. Hot, somewhat cloying caramel and tart rasberry sour. Long finish, really stays with you. Mouthfeel is cloying and thick. Drinkability- Not so much. Too thick and cloying, long sour finish is too much for me. Look: Dark burnt orange with some ruby/ pink highlights topped off with a 1 finger white foamy head that quickly fades into a ring around the glass. Smell: Juicy raspberries dominate the nose, alcohol is present. Taste / Mouthfeel: Sweet raspberries, very juicy upfront followed by pungent warming alcohol, somewhat spicy in the finish. Mouth feel is clean and medium bodied. Overall: Solid, a good brew to share with friends. I'd like to cellar a couple of these and see if the alcohol calms down a little bit. Purchased in Richmond Va at Carytown W&B. Poured with a slight head that disappears quickly. The smell of raspberries and alcohol come immediately from the glass. The first sip I think this is some sort of raspberry champagne. Then the hops come out slightly and then as you breath the alcohol comes out. Nice warm feeling on the tounge, doesnt overpower the flavors though. Excellent ballance of the 3. The berry flavor seems to stay in the cheeks. The only down for me was the body was pretty good but seemed a little heavier than I would have expected. Im not sure how much sugar was used but maybe a little less, even if it lowered the alcohol, would have been nice. This is overall the best beer to introduce someone unlearned in the quality beer world, or even beer for that matter. It would absolutely hook anyone, including me, who didnt mind a little cha-ching for an excellent beer. Got one more Im holding on to with a Pangea for special occasions.